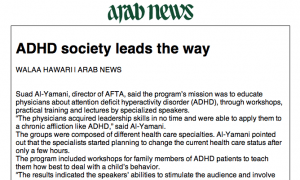 Suad Al-Yamani, director of AFTA, said the program’s mission was to educate physicians about attention deficit hyperactivity disorder (ADHD), through workshops, practical training and lectures by specialized speakers. “The physicians acquired leadership skills in no time and were able to apply them to a chronic affliction like ADHD,” said Al-Yamani. The groups were composed of different health care specialties. Al-Yamani pointed out that the specialists started planning to change the current health care status after only a few hours. The program included workshops for family members of ADHD patients to teach them how best to deal with a child’s behavior. “The results indicated the speakers’ abilities to stimulate the audience and involve them in planning for a bright future for ADHD patients,” said Al-Yamani, stressing her confidence that by the end of the program, results would bring around a new generation of leaders in health care.